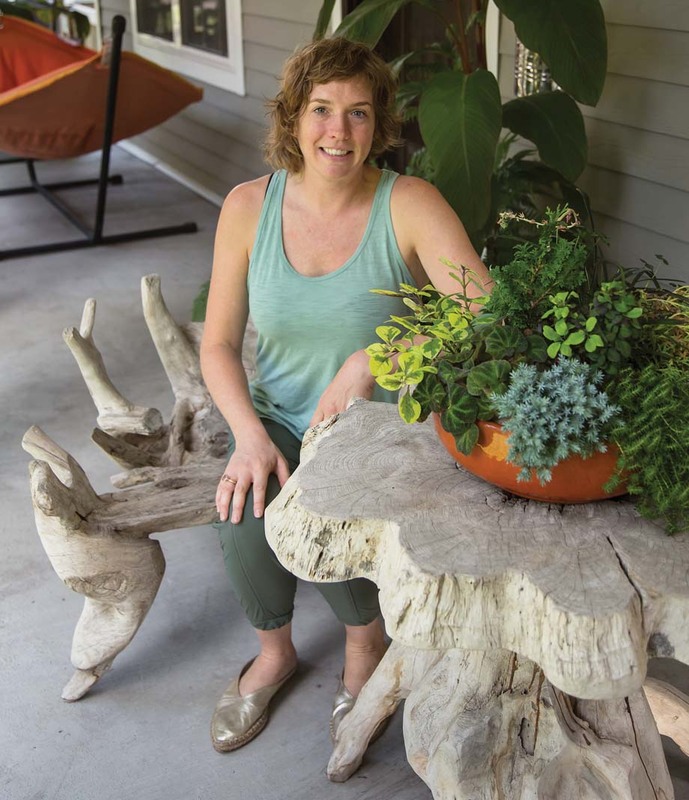 Homeowner Meg Olson found inspiration for her garden through family trips to the Boundary Waters. Few city dwellers can say they have an island in their backyard. But Minneapolis graphic designers Meg and Chad Olson have even more than that—they’ve also got a waterfall, creek, frog bog, and hot tub. 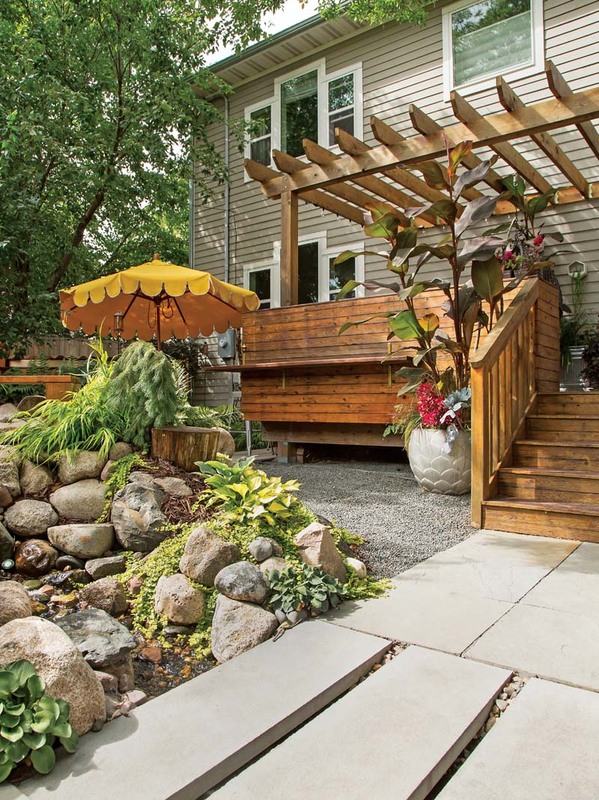 Fitting everything into their standard-size city lot wasn’t easy, but between the couple’s love of “dreaming up crazy things” and an imaginative collaboration with Tangletown Gardens designer Olivia Spyra, they managed to fit just about everything on their wish list into the space in a beautiful fashion. This crazy idea, which they think of as a “natural playground,” was inspired by family trips to the Boundary Waters, Meg explains. “You know how you canoe past all those tiny little islands and some aren’t even big enough for a tent? Well, we found one we loved and would always go back to, so we thought we’d bring some of those good memories and nature back home,” she says. 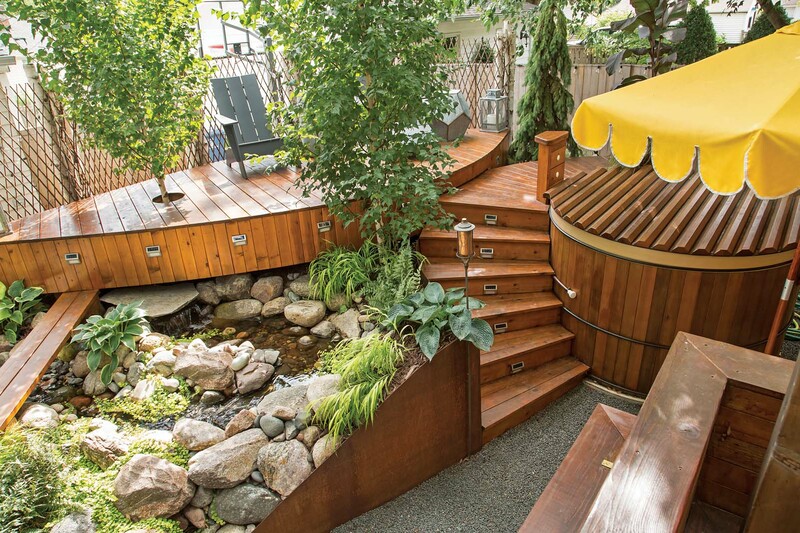 Adding in a hot tub, they reasoned, would be a fun way for the four of them—Meg, Chad, their eight-year-old son Henrik, and their four-year-old daughter Fern—to spend time together outdoors in all seasons. 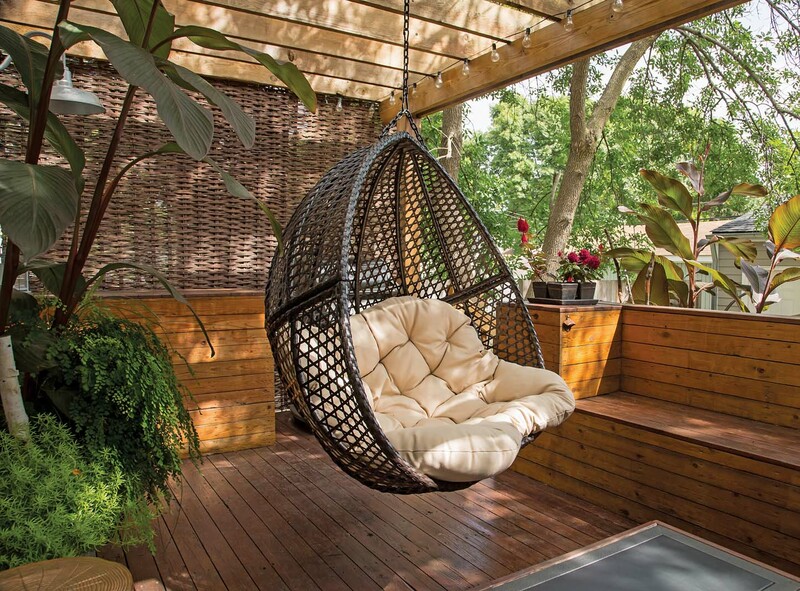 The back door leads to a porch with a pergola-covered deck that includes a built-in bench, a cozy hanging chair, and a gas fireplace—a perfect spot for the nature-loving family of four to gather around in all seasons. Working closely with Spyra, they created an experience that begins the moment the family steps out the back door onto the porch with a pergola-covered deck that includes a built-in bench, a hanging chair for two, and a gas fireplace. The leaf-shaped island, connecting stairs, and nearby hot tub are all made of cedar. With two active children exploring the space, the homeowners and garden designer chose to surround the house with hardy, low-maintenance foliage such as Japanese forest grass and ghost fern. Down the stairs, a short walkway leads to a bridge that goes over the frog bog at the base of the waterfall and creek. The spot is a favorite of Henrik’s, and it always makes Meg and Chad happy to see him spending time there watching and caring for the frogs he catches, along with the ones that hop over from the neighbor’s yard. Upstream, corten steel partially borders the raised, leaf-shaped island which, along with the connecting stairs and hot tub, was made from cedar. Ultimately, Meg says, the backyard is exactly what they dreamed of, a natural playground for the whole family to enjoy, especially their kids. “We love being out in nature and we really want our kids to be able to play outside in an adventurous way,” she says. The frog bog at the base of the waterfall and creek is a favorite spot of the family’s son, who enjoys catching and caring for the frogs. 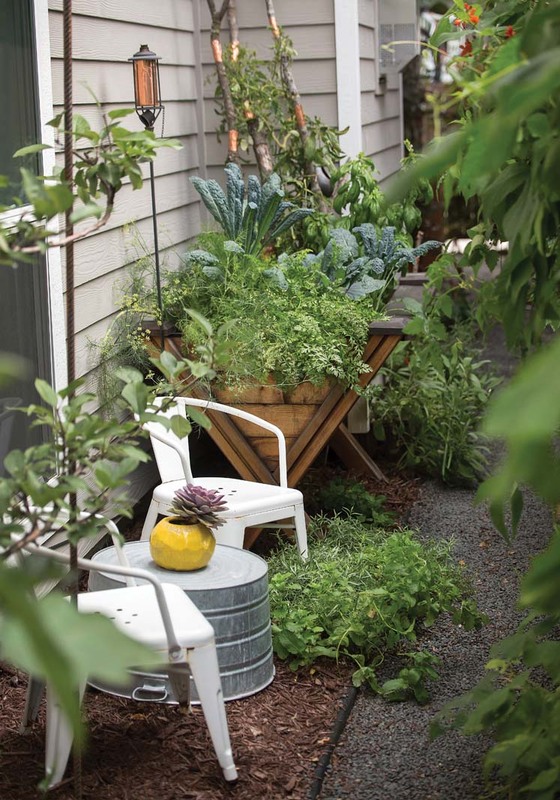 Meleah Maynard, a Minneapolis-based master gardener, writer, and editor, is a frequent contributor to Midwest Home.